The former Prime Minister of Belize, Said Musa was arraigned in Belmopan Magistrate’s Court today, Dec. 4th, 2008 on a charge of theft US$20 million of public funds. This money was a grant to the people of Belize by the Venezuelan Government for low income housing. Mr. Musa appeared in court at 9:00 a.m. with his Senior Counsel, Edwin Flowers and six other members of his legal team. Bail was set at Bz$100 thousand dollars and a surety of the same amount. He is scheduled to re-appear in court on Jan. 9th, 2009. The Director of Public Prosecution’s office said additional charges will be leveled against Mr. Musa later this month for dereliction of duty. 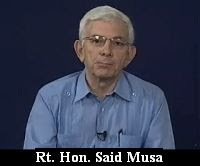 Mr. Musa said he is innocent of these charges or any other charges they threatened to bring against him. His Budget Minister, Ralph Fonseca is scheduled to appear in Belmopan Magistrate’s Court tomorrow in connection with the same incident. Thanks for the latest information concerning our former Prime Minister. It goes to show that even the mighty can fall. I hope our Belizean people will open their eyes now and see the injustice that our previous Government has done to us. Linda, I enjoy reading the articles on your blog. It is interesting to read about other people and places too. What goes around ....Comes around. It is important to remember that according to the justice system we subscribe to, the accused is innocent until proven guilty in a court of law. Even those who held the reins of power are entitled to that. It didn't stick... nothing ever does. They're still thiefing and getting away with it in Belize...not just Musa, but all of this Ministers. The largest of group of intellectual crooks this country has ever seen. Karma has a way of granting them nothing, in the end... someone is keeping score. Mr. Barrow is a disgrace to the country he leads, and the people he represents. In the years that the UDP were in power, prior to the Musa/PUP administration, the UDP adminiustration was arrogantly running around as in the lawless, wild American west of old, and robbing the country blind. It is shameful and highly repugnant that Mr. Barrow would allow his personal dislike of Mr. Musa to rise to such a level of abominable distraction. Get your priorities straight, and start doing the job you were elected to do. Your politics of personal distruction, and slash and burn mentality has no place in a civilized society, and is counter-productive to the interests of the citizenry who elected you. You are acting like a Neandertal Thug wearing a suit. Put your petty squabbling with Mr. Musa aside, and get about the business of governing the country responsibly, and effectively, and start acting in a mature, grown-up manner. You are the Prime Minister....act like one. Your childish dispute with the former Prime minister is projecting an image of a craven, coveteous, individual, who is begrudging the spoils of another, because he may have stolen a little more than you have. Why don't you just go ahead and slam the cuffs on, and present yourself to the magistrate with the same charges you brought on Mr. Musa...perhaps you will be even then. You and Mr. Musa are one and the same.....you are no better than the other; only that he did not drag you and Esquivel in front of the magistrate.